Thisstory was updated at 10:50 p.m. ET. Adocking port malfunction is preventing a Russian Soyuz spacecraft from leavingthe International Space Station as planned tonight (Sept. 23), forcing itsthree-person crew to remain in space for at least two extra orbits as engineerson Earth study the glitch. TheSoyuz TMA-18 spacecraft was slated to undockfrom the space station at 9:34 p.m. EDT (0134 Sept. 24 GMT) in order to returntwo cosmonauts and one American astronaut back to Earth after six months inorbit. But a set of hooks locking it to its docking port have refused tounlatch, NASA officials said. "Itis not clear as to why the hooks won't drive open, but we have passed the timefor a nominal undocking," NASA commentator Rob Navias said in a NASA TVbroadcast. Engineers at Russia's Mission Control center near Moscow arestudying the issue and working on backup plans, he added. Thelanding will be some 248 miles (400 km) north of the original landing targetzone, NASA officials said. TheSoyuzspacecraft is slated to return American astronaut Tracy Caldwell Dyson toEarth alongside her Russian crewmates Alexander Skvortsov and Mikhail Kornienko.They are wrapping up a nearly six-month mission to the InternationalSpace Station. Butin order to return to Earth, the hooks securing their Soyuz to the spacestation must be released. Thestuck hooks are on the space station's Poisk docking module, a chamber mountedto the top of the space station Russian segment. These hooks, along with otherson the Soyuz side, ensure the spacecraft and station are securely attachedwhile docked. Russianflight controllers assured the Soyuz crew that they are still slated to returnhome tonight. "Thereis no cancellation in the cards for the moment," a flight controller said. 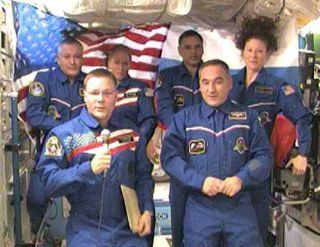 Skvortsovsaid he and his Soyuz crewmates are doing well. Mission Control told them totake off their landing spacesuit gloves and get comfortable while they wait. "We'refeeling fine and we're ready to proceed," he said. NASAwill broadcast the upcoming Soyuz spacecraft undocking and landing live on NASA TV. Undocking andlanding coverage begins at 9:15 p.m. ET (0115 Sept. 24 GMT). Click here live space station missionupdates and a link to NASA TV.